Having worked with the Teensy 2.0 for my ErgoDox, I originally planned to use the ARM-based Teensy LC for my controller. Since there wasn't much in the way of device or board support for it in the embedded rust world, I went down the rabbit hole of building it mostly from the ground up. Everything looked to be going alright - I had a basic "blink" program that I could build and load that seemed to work for the most part, but then I decided to add an interrupt handler. This was apparently enough to brick my Teensy. The chip on the Teensy-LC, the MKL26Z64VFT4, has a small flash-config section inside the main flash region of memory, which is what the comment in the memory.x example alluded to. As far as I could tell, I managed to either load some bad data into that region when flashing my board (which the teensy bootloader is supposed to prevent), my running code somehow managed to touch it, or something else entirely went wrong. At any rate, my first Teensy-LC stopped showing up as a USB device even when the reset button was pressed. As a part of my debugging process, I flashed the same program to my second Teensy-LC to make sure that it was in fact my program that had killed it and not some other electrical issue I may have induced. Turns out I was right, and both boards were now inoperable. Whoops. I created a thread on the PJRC forum in hopes that someone would have some ideas for me, or perhaps some replacement boards since, from what I gathered, it wasn't supposed to be possible to brick them in this manner. Alas, no replies. One of the major failings of the Teensy family is their lack of an accessible hardware debugging interface. While the core microcontroller technically has a debugging interface, it's "hijacked" by the bootloader/flasher coprocessor, making it unusable without some hacking that I didn't feel up for, especially since I had already killed two boards. I suspect that if I had a real debugging interface to connect to, I might have been able to recover them, but since the proprietary incommunicado bootloader was the only way to program them, I was out of luck. I'd always heard great things about the STM32 family and their debuggability, in addition to pre-existing Rust support, so I went looking for a suitable board in that vein. I pretty quickly found the stm32duino wiki and their list of STM32F103 boards. The RobotDyn "Black Pill" seemed like it would do the trick, so I grabbed 5 of them from their site. A simple "blink" program is usually a good first pass at any embedded development target. I've been using the one from the stm32f103xx-hal crate. The setup of the Rust project is covered pretty thoroughly in the Embedded Book, so I won't go into much detail on it here. The STM32 family comes with their own built-in bootloader that supports flashing over pretty much any serial peripheral, such as I2C or UART. I happened to have one of these USB to TTL cables laying around, so that made flashing the boards pretty straightforward. Wrote and verified address 0x0abcdef0 (100.00%) Done. For this, the BOOT0 pin (closest to the USB port) needs to be jumpered high when the board is powered up. This puts the device into bootloader mode. In order to actually run the code, the board needs to be started with BOOT0 jumpered low. This is obviously a bit of a pain when trying to iterate quickly. Luckily, it's not (usually) necessary when you have a real debugger. Running code is fun and all, but what I really wanted was a way to debug it. Enter Black Magic Probe. Black Magic Probe is an open-source on-chip-debugger that runs its own GDB server, so it doesn't require any additional tooling on the host side. It runs on quite a few platforms and can target many common Cortex-M and Cortex-A controllers. Wrote and verified address 0x08001c4c (100.00%) Done. Again, BOOT0 must be jumpered high for this. From there, everything else could be done over USB with BOOT0 held low! An interesting quirk of the STM32F103C8 chips is that, while they're only declared to have 64KB of flash, nearly all of them in reality have 128KB. This isn't guaranteed, YMMV, etc., but for my purposes, this is great news, considering that BMP takes more than 64KB. dfu-util, unfortunately, will respect the announced 64KB limit and will refuse to flash the blackmagic.bin. Fortunately, there's a script in the BMP project (scripts/stm32_mem.py) that disregards the announced memory. Now we have a fully functional BMP debugger! Now the real fun begins. 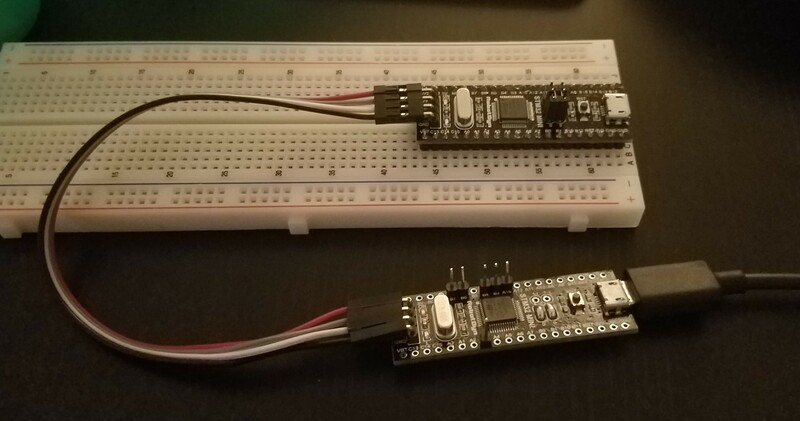 The BMP reuses the SWD pins at the opposite side of the board form the USB port for its own connection to targets that are begin debugged. This makes connecting everything fairly straightforward. SWDIO to SWDIO, SWCLK to SWCLK, etc. Since the BMP provides power to the target, no additional connections are strictly necessary aside from Host USB->BMP and BMP->Target SWD. In this picture, my debugger is the one without the full headers and with the boot pins pulled permanently low. When the BMP is plugged into the host computer, it shows up as two CDC ACM devices - effectively two serial devices. The first is the debugging interface and the second is its USB->Serial adapter. We're just going to worry about the debugger for now. 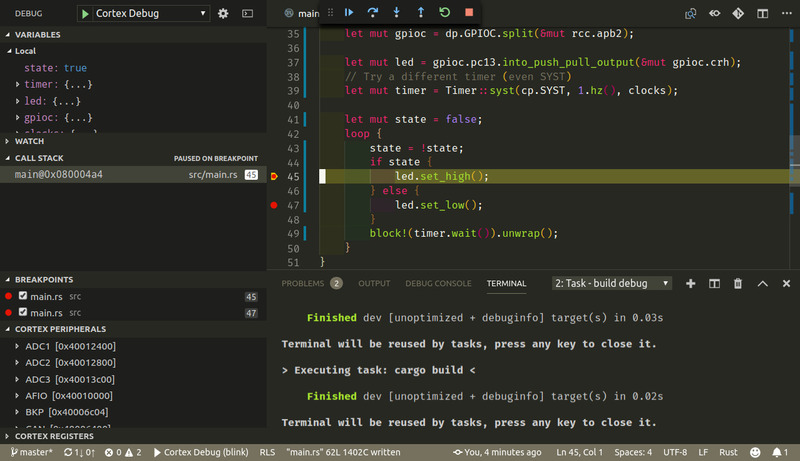 The debugger runs its own GDB server, so attaching to it only requires the appropriate GDB. (gdb) monitor swdp_scan # First scan for connected targets. Note that it pauses whatever is currently running on the target. Since it's the program that I'd loaded previously, I get source/line information, but you may not if you haven't loaded anything yet, or if the code on the controller differs from the binary you're using. Transfer rate: 17 KB/sec, 910 bytes/write. And then, of course, running! Interrupting the program and adding breakpoints all work pretty much as expected, which blew my mind! Breakpoint 1 at 0x800028a: file src/main.rs, line 42.
runner = "arm-none-eabi-gdb -q -x bmp-connect.gdb -ex run"
and then the program can be flashed and executed with just cargo run! and also the "device" entry, which allows the debugger to display the device peripherals. With this, everything "Just Works!"